Coast Guard families are getting a bit of relief thanks to a Chula Vista man stepping in to help during the government shutdown. 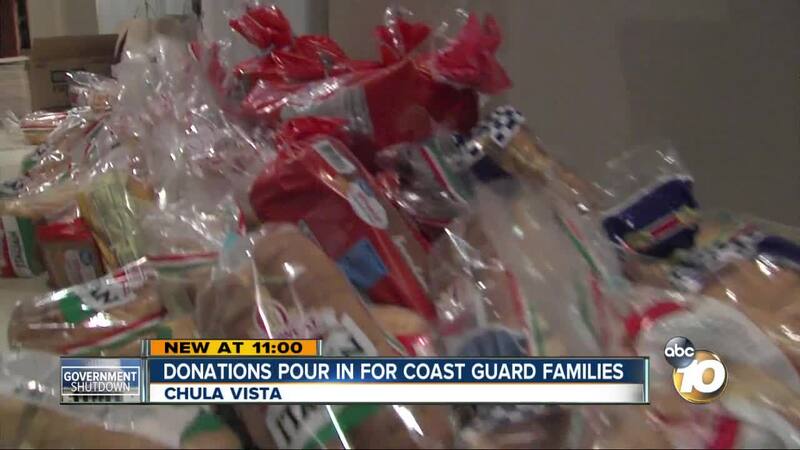 CHULA VISTA, Calif. (KGTV) -- Coast Guard families are getting a bit of relief thanks to a Chula Vista man stepping in to help during the government shutdown. Marlow Martinez is the founder of the Marlow B. Martinez foundation, a non-profit serving the South Bay. Martinez decided he was going to start collecting food donations for Coast Guard families who aren't receiving a paycheck because of the shutdown. His goal was to collect 50 bags of food, but in just three days they collected 100 bags of groceries. On Sunday, two Coast Guard families loaded the food into a pickup truck to transport it to the base for those who need it. Martinez says he hopes the shutdown ends soon so the families can get paid. The food will be distributed to families on base Wednesday afternoon.